As one of the most recognizable names in inventive history, Edison’s numerous innovative ideas and creations are legendary. He held more than 1,000 patents, a record only broken very recently, and developed ground-breaking technologies like the electric light bulb, phonograph, batteries, and so much more. During the late 1880’s Edison was very concerned about the cost of iron, which was impacting the price of some of his inventions, like the electric generator. After some thought and research, he believed he found a solution: build a separation plant to pulverize low-grade iron ore and produce an abundant supply of iron. Once the massive plant and supporting town was built, things didn’t quite go as planned. The machines disastrously failed, causing Edison to lose a substantial amount of money. A few years and a new successful design later, the entire endeavor still failed when iron extractors began to mine the Mesabi iron range in Minnesota, cutting iron costs so dramatically that Edison closed his plant entirely. Nonetheless, there was a major silver lining in the failure. 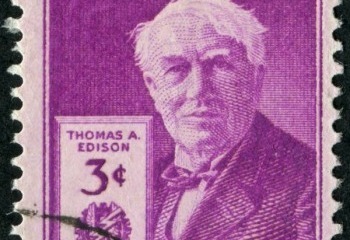 Edison took what he learned and later applied some of the methods to concrete production, which ultimately became one of his major entrepreneurial successes. Today’s cable news programs may often discuss the inefficiencies of the United States Congress, but Edison was dreaming up a solution almost 150 years ago. Just like today, the Senate voted on issues one by one – an inherently inefficient process that Edison wanted to change. As it turns out, the device Edison created, the electrographic vote-recorder, was one of his first patented inventions. Though the recorder could have saved hours of procedural time during Senate sessions, Edison’s creation was soundly rejected when he proposed it in Washington D.C. because political leaders worried that it would subvert the entire legislative process. Have any suggestions for our next “Failing for Success” story? Give us a shout on Twitter, Facebook, and LinkedIn. And don’t forget to subscribe to our IV Insights blog and check out our Behind the Breakthrough profiles to hear first-hand from top inventors, innovators, and more. To kickoff National Inventors Month, we’re featuring inventor, entrepreneur and IV partner Rafal Krepec of Lanomat, Inc. Rafal invented, patented and is now developing the DuoPad, a breakthrough in the world of graphical interface design and computing.